Lush Fab Glam Inspired Lifestyle For The Modern Woman: YOU Can Become A Designer At ModCloth. YOU Can Become A Designer At ModCloth. Have you always dreamed of becoming a fashion designer? Well now that dream can come true! The ModCloth Make The Cut program is a recurring design contest that invites the ModCloth Community to design garments, graphics, or fabric prints. Its main purpose is to further their mission of democratizing fashion by producing clothing designed by community members. Read on to learn more about ModCloth's Make The Cut:'Prints' Charming contest and to see how YOU can become a designer at ModCloth! Contest is Live Now! Entrants will design a new print for a private label dress silhouette that is already being produced. Contestants have two weeks to submit designs. 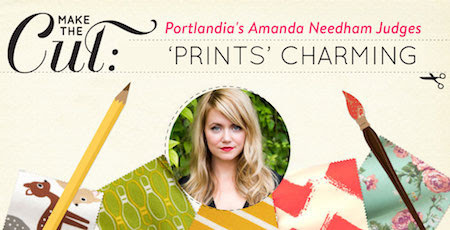 After the submission period (which ends Friday 02/14/14) the ModCloth Creative Team will narrow down the submissions to 20, which will be sent to the guest judge, Amanda Needham, Costume Designer for Portlandia. After Amanda has chosen the 10 finalists, they will be posted on the Be The Buyer page for voting. There will be a week (from March 3-10th, 2014) for the Community to vote. Then ModCloth will contact the winner on Wednesday 3/12/14. The winner will also be announced on ModCloth's Blog. Send your entry in now for your chance to become a designer at ModCloth. This post is brought to you by ModCloth. Know an aspiring fashion designer? Help make their dreams come true by sharing this post and contest with them.